Here are 5 easy steps for this sultry eye makeup method. It's pretty quick and easy with awesome results! This method is for use with powder eye shadow. If you’re using a brush, use it slightly wet to intensify the colors. Dip the brush just on one area of the eye shadow if it’s pressed. This is to avoid wetting it and introducing bacteria to your shadow. Start with the black pencil liner. A kohl liner here works well. Its has intense color and is easy to smudge. Begin by lining your waterline. Then trace line around your whole eye, except on the inner corners. 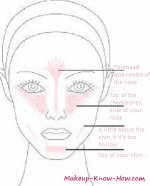 Take the black eye shadow and apply it over and above this line, all around the eye. Almost as if you’re smudging the eyeliner at the same time. You’ll end up with a dark, smokey rim around the eye. Blend it so that it’s not a harsh line around the eye. The key to a great smoky eye is to make the eyes look like they’re sizzling. They’re releasing this black dust coz you’re just sooo hot and you just can’t help it. So you want it to be dark, but softly oozing from your lashes. That’s why you have to blend, blend, and blend! Take the eye shadow to the outer corner of the eye, and apply it inside the lid. Then blend it upwards so that it goes just above your crease. Whip out the shimmery color and apply it to the inner part of your lid. Take it just above your crease. Do this to the same extent that you did with the black. Then magic it by blending upwards. Also make sure to blend it where it comes into contact with the black eye shadow. You can stop here, or add another dimension with a third, highlighter color. Apply the highlighter color just on the inside corner of the eyes for some sparkle. Then underline you eyebrows with it. Apply mascara, concentrating more layers on the outside lashes. Use lengthening mascara because smoky eye makeup tends to generally hide your lashes if you're using black eye shadow.